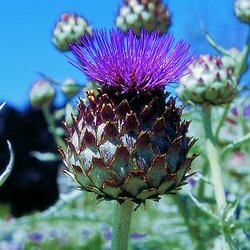 Part of the Artichoke family but from Cardoon you can eat the stems not the flowers&comma; which as with artichokes are very pretty. Large silvery spiky leaves with a beautiful pink/purple thistle like flower. The stems can be fried&comma; boiled&comma; blanched eated on its own or added to soups and stews. Once you have blanched the stems for 4-5 weeks(see growing instructions)&comma; de-string them and add to soups and stews. Or can be boiled and eaten on their own.